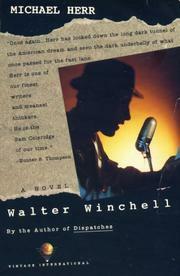 A movie novel of tremendous sweep and detail, zapping us with the America of the Thirties and Forties as seen through the eyes of gossip-monger Walter Winchell. Herr, the jivey author of Dispatches (1977), undertakes a spacious picture of US society in pre- and post-WW II and nails it all down in 156 pages. This tour de force presents itself as a movie script, with synoptic montages, scene cuts, and dialogue in script form. Its compression releases a great brio to the page, sends a flow of images racing over the reader's mind, and strips to bare bone a form first handled by John Steinbeck in his novelizations of The Moon Is Down and Of Mice and Men. All these storytelling smarts would get Herr by on their own, but he reaches masterfully beyond mere form by invoking our sympathy for the kind of "great villain" Henry Fielding drew so delightfully in Jonathan Wild Few would think that Broadway columnist Walter Winchell would lend himself to such treatment. But Herr limns Citizen Winchell from childhood to old age with deep understanding, and achieves a peak of pure energy with Winchell lording it at the Stork Club and rat-a-tat-tatting his radio show. Not only does Winchell stride off the page with his compulsions edged and shaded to perfection, but his cronies as well receive strong treatment: affecting scenes abound with Winchell's great buddy sportswriter Damon Runyon, Stork Club owner Sherman Billingsley, and press agent Irving Hoffman (read Irving "Swifty" Lazar?) that ink themselves forever into memory--as does Herr's brilliantly realized Chorus of Press Agents groveling at Walter's feet when he is King and bad-mouthing him when he is at last a wandering Broadway ghost. Sumptuous entertainment.